Never has a game, made by so few, been hyped by so many. 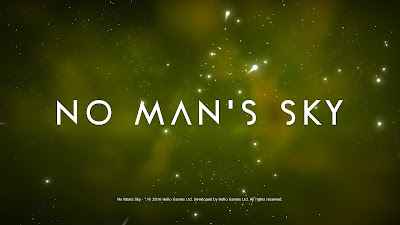 For a game which, until very recently, no one had spent that much time with, No Man's Sky has also taken on deity status amongst those of us burdened with the need for space exploration. I have received a copy early, through entirely legitimate means mind you, and no I didn't spend over a thousand dollars on it. I just pre-ordered it and it arrived on Saturday (06/08). So I've obviously sat in front of my screen, mouth agape and slightly moist, shoving it into my eyes as fast as possible. Here's my opinion, if you are avoiding any details of this game don't read this. I can't include video because all the major hosters are removing anything to do with the game but I do have some screenshots. Please bear in mind this is merely one idiot's opinion on a game which still has a pre-release patch to be downloaded and therefore does not represent the finished product and who the hell am I to sway your mind.